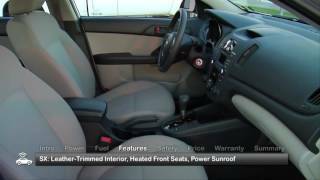 Available in LX, EX and SX trim levels, the stylish and feature-packed compact sedan, Kia Forte 2012, starts at $15,200 for the base trim. 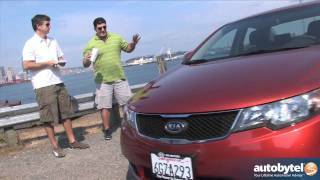 IRVINE, Calif., September 26, 2011- The Forte sedan and its sibling hatchback return to the Kia vehicle lineup for 2012 with an impressive combination of smart styling, value, technology, safety features and comfort. 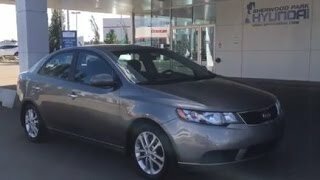 Named a 2010 and 2011 "Top Safety Pick"1by the Insurance Institute for Highway Safety (IIHS) and to MSN Autos' 2011 "Top 10 Cars Under $15,000" list, the Forte and Forte 5-door offer today's tech-savvy consumers with attractive, fuel-efficient and fun-to-drive options in the compact segment. Fuel economy for the Forte and Forte 5-door improves for 2012 to 26/36 miles per gallon (mpg)2(city/highway) – a one mpg city and two mpg highway improvement – and both vehicles receive appearance and convenience enhancements, including a standard telescopic steering wheel for all EX trims and the addition of the Supervision™meter cluster to the EX Technology Package. The Forte EX sedan interior "coffee" color has been replaced with black cloth, giving the interior of the Forte a broader appeal and more upscale appearance. Available in LX, EX and SX trim levels, the stylish and feature-packed compact sedan starts at $15,2003for the base trim. 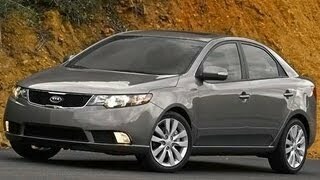 The Forte 5-door is offered in EX and SX trims and pricing for the versatile hatchback begins at $18,100. Both the sedan and 5-door offer standard convenience features including air conditioning, SiruisXM™Satellite Radio capabilities with three months complimentary service4, MP3 connectivity andBluetooth®wireless technology5and steering wheel-mounted audio controls. Launched as part of Kia Motors' design-led transformation, the Forte sedan and Forte 5-door stand out in the compact segment with a bold look set apart by crisp lines, swept-back headlamps and a sleek profile. Both the sedan and 5-door project a clean and assertive presence with sweeping window arches, smooth fender flairs and body-color side mirrors and door handles, while turn signal indicators are integrated into the side mirrors on EX and SX trims to add to the upscale appearance. Tasteful design cues are effortlessly streamlined to the rear with angled, wrapped tail lights and an uncluttered rear fascia, with SX models adding a silver-finished exhaust tip. Forte SX models exude a more athletic profile with 17-inch alloy wheels and P215/45R17-sized tires. Keeping a relatively small footprint without sacrificing comfort for up to five passengers, Forte sedan and Forte 5-door come with a wheelbase of 104.3 inches, an overall width of 69.9 inches and overall height of 57.5 inches. The Kia-engineered body achieves high torsional stiffness and gives the Forte sedan and Forte 5-door taut, responsive handling, a smoother ride quality and greater refinement than its competitors. A specially tuned, Kia-developed suspension provides responsive handling on S-turn-laden roads, and additional noise, vibration and harshness (NVH) countermeasures are fitted throughout to help ensure a comfortable ride with low noise levels in the cabin. The front-wheel-drive unibody structure employs an independent front suspension with MacPherson struts and a stabilizer bar and a torsion beam rear suspension with monotube shock absorbers and coil springs. This combination helps provide the optimal balance of handling and comfort. An engine-speed-sensitive, power-assisted rack-and-pinion steering system adds the finishing touch for precise handling by providing the most advantageous amount of electronic assist for varying road conditions. In keeping with the energetic essence of the SX model line for the Forte sedan and Forte 5-door, a performance-tuned suspension gives the chassis a firmer feel and responsiveness resulting in a more spirited ride. The SX model also features larger front brakes for improved stopping capabilities. Driver and passengers are enveloped with a spacious 96.8 cubic feet of passenger volume for the Forte sedan and an even larger 97.5 cubic feet for the Forte 5-door, along with an impressive 40.0 inches of headroom and 43.3 inches of legroom in the front seats and 37.6 inches of headroom (38.4 inches for the 5-door) and 35.0 inches of legroom in the rear seats. The Forte sedan's trunk also offers an astounding 14.7 cubic feet of cargo space, while the Forte 5-door's 19.4 cubic feet provides ample room for luggage or around-town grocery shopping. Capitalizing on the spacious interior, the Forte sedan and Forte 5-door integrate style and function, starting with a crisp, high-visibility center stack and a driver-oriented three-gauge instrument cluster exuding a stylish red glow. Pampering riders further, both versions offer a host of standard interior features, starting with comfortable, nicely appointed full cloth seats. A six-way adjustable driver's seat, tilt steering column, rear defroster and dual 12-volt power outlets in the center console are driver- and passenger-conscious luxuries standard on every vehicle. EX and SX models offer a number of additional standard luxurious touches such as: power windows and door locks, remote keyless entry, air conditioning, map lamps, steering wheel-mounted audio and cruise controls, telescopic steering wheel, tweeter speakers, dual front and rear cup holders, and floor mats. Steering wheel paddle shifters come standard on all SX trims to make for a more spirited driving experience. Forte EX sedan also offers an optional Premium Package that includes a power sunroof with tilt and 16-inch alloy wheels outfitted with 205/55R16 tires (Forte 5-door EX comes with standard 16-inch alloy wheels). The power sunroof with tilt also is an available stand-alone option for all SX trims and the EX trim on the Forte 5-door. The EX and SX Technology Packages, available on both sedan and 5-door models, includes navigation with SiriusXM Traffic™6, fully automatic temperature control, push-button start with Smart Key, Supervision meter cluster (standard on SX), fog lamps (EX package only), automatic headlamps and chrome exterior door handles. The available SX Leather Package offers additional luxurious enhancements, including leather seat trim, heated front seats and an auto-dimming electro-chromic rear view mirror. The sporty SX model brings even more standard features for the sedan and 5-door, including a unique black interior with sport-cloth fabric adorned with red stitching, a telescopic steering column, leather-wrapped steering wheel and shift knob and metal-finish trim and pedals. The Forte LX and EX trims are powered by a 2.0-liter DOHC four-cylinder engine, producing a forceful 156 horsepower and 144 pound-feet of torque7and featuring Dual Continuously Variable Valve Timing (CVVT) and multi-port electronic fuel injection, both of which provide for greater performance and fuel economy. The SX features an upgraded 2.4-liter inline four-cylinder engine, also with Dual CVVT, which delivers 173 horsepower with 168 pound-feet of torque8. Coupled with the powerplants are six-speed manual and six-speed automatic transmission options. Forte LX comes standard with the six-speed manual while EX and SX trim levels offer a standard six-speed automatic transmission with Sportmatic™clutchless shifting (optional on the LX trim). This six-speed automatic transmission is a proprietary design for Kia Motors that was engineered and built specifically for Kia vehicles. Offering impressive fuel economy, the 2.0-liter engine boasts a competitive 25/34 mpg9(city/highway) when mated to the manual transmission and the enhanced 26/36 with the automatic transmission, while the 2.4-liter engine turns out a notable 23/32 mpg (sedan and 5-door) and when coupled with the automatic transmission. The optional Fuel Economy Package, available on the EX sedan model with the 2.0-liter powerplant, includes electric power steering, "smart" alternator, low-rolling-resistance silica tires and aerodynamic enhancements. These improvements result in 27/37 mpg and an impressive combined fuel economy of 30 mpg. In addition to comfort and performance, driver and passengers also will be entertained by Forte's impressive combination of standard convenience features, starting with a four-speaker AM/FM/CD/MP3 audio system outfitted with SiriusXM Satellite Radio capabilities and three months complimentary service. Also standard on all models is an auxiliary audio input jack and USB port for connecting personal MP3 players as well asBluetoothwireless technology connectivity with steering wheel-mounted controls, which enables hands-free operation for all compatible cell phones. For true audiophiles, the EX and SX trims add a standard six-speaker audio system. Forte's advanced system also includes Speed Dependent Volume Control (SDVC), which automatically increases the volume at higher speeds for better listening enjoyment, and Power Bass, which automatically enhances the bass response and tone. Forte offers an impressive array of standard safety equipment, featuring front active headrests, dual advanced front airbags, front seat-mounted and side curtain airbags, full-length side curtain airbags, side-impact door beams, front and rear crumple zones, four-wheel disc brakes with an Antilock Brake System (ABS), Electronic Brake-force Distribution (EBD) and a Brake Assist System (BAS), Electronic Stability Control (ESC), a Traction Control System (TCS) and a Tire Pressure Monitoring System (TPMS).